Cat Co 3 chain famous beaches attract tourist island of Cat Ba. 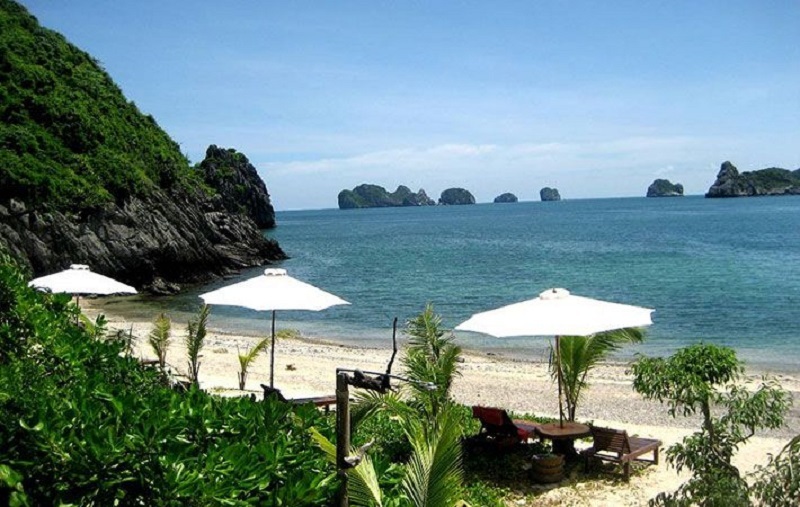 In Cat Ba has hundreds of large and small beach , but clusters Cat Co beaches (Cat Co 1 , 2 , 3) is where a lot of tourists to the most by the rich natural landscape. Cat Co 1 beach is wide and beautiful, lying around under the mountain, surf year round, fresh air and clear waters, is where a lot of tourists to rest and shower. Cat Co beach 2 has a little serenity and mystery. Cat Co 3 beach bear quite modern colors. On the shore, outside entertainment area is the population hostel -style small villa to suit every family. Although the beach is not attractive as Cat Co beach 1 and Cat co beach 2, this is where many waves and quite deep, suitable for good swimmers. Finished swimming, relaxing on sandy beaches or enjoying drinks and seafood specialties, you'll feel all the beauty of the sea, especially at sunset. Tung Thu Beach on the island of Cat Ba newly opened mid 2010. As the beach is planned to follow the international regulations, so beautiful is the free table, travel services and rich and full. In particular, this is the unique place in the island of Cat Ba has an outdoor stage on the beach and is designed with a unique idea. Tung Thu Beach Cat Ba tourists would love to because here the sea and the beach is very clean and scenic. Monkey Island is a small island located 2km from Cat Ba town. Beach is approximately 1 km in length, located on Monkey Island and beaches called Cat Dua. This is really beautiful beach of Lan Ha Bay. Here, new visitors really feel the beach in Gulf by sea in this absolutely clear and clean. To reach Monkey Island, tourists traveling from station Beo boat, Cat Ba town about 2 km. In fact, at Monkey Island has a smaller beach called Pineapple beach. This beach is mainly for high-end tourists including visitors and international tourists Vietnam. It offers resort -style Resort - Monkey Island Resort with the traditional housing (thatch, bamboo, leaves). If you do not want loud, this is the ideal destination of Cat Ba Island.